"Like grandma used to make! Serve over or beside a bed of rice." 1Preheat oven to 350 degrees F (175 degrees C). Lightly grease a 9x13-inch baking dish. 2Heat a large skillet over medium-high heat. Cook and stir beef in the hot skillet until browned and crumbly, 5 to 7 minutes; drain and discard grease. 3Stir beef, mushroom soup, celery soup, water chestnuts, celery, water, Monterey Jack cheese, almonds, mushrooms, soy sauce, and black pepper together in the prepared baking dish. Cover dish with aluminum foil. 4Bake in preheated oven for 45 minutes. 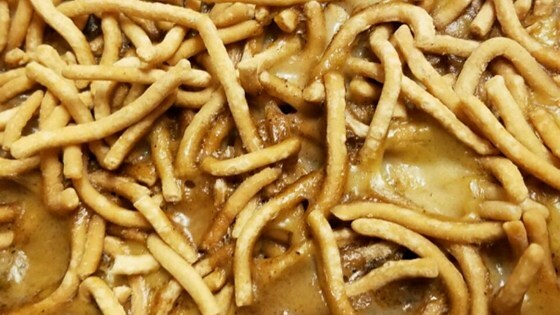 Remove aluminum foil and sprinkle chow mein noodles over the top of the casserole. Continue baking until the casserole browns around the edges, about 30 minutes more.